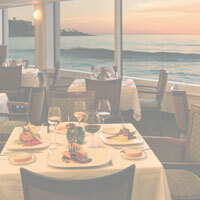 Located right on the surf in La Jolla, California, The Marine Room is one of the best fine dining restaurants in San Diego County. Getting to our award-winning restaurant on La Jolla Shores is a breeze, as we are just a few minutes from major thoroughfares, and 12 miles from Downtown San Diego. Follow the directions below or add our address into your GPS and be on your way in no time. For added convenience, The Marine Room offers valet parking for a nominal fee so you can arrive and find yourself browsing our menu in minutes.